I am using the 'dev' version of Google Chrome (what else would you expect from the author of this website). I like to try out new features. So I went to the about:Flags (click link only in Chrome) page and enabled a few interesting things. One of them was the ability to load up pages before you even visit them. 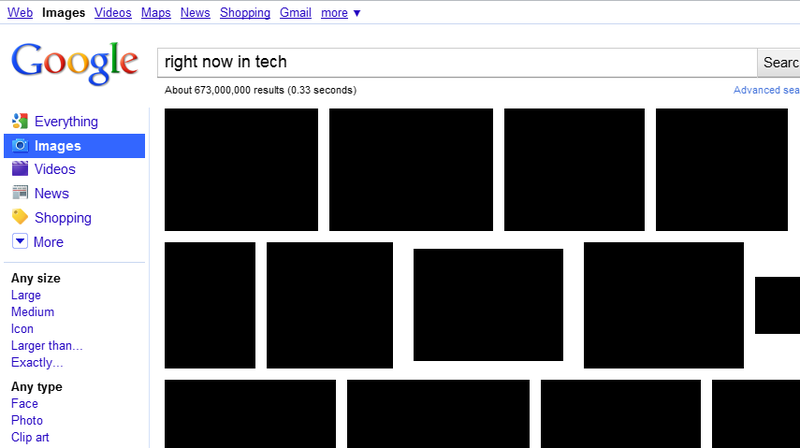 Soon, I noticed that Google Images search pages had just black thumbnails. I could mouse over the black squares and rectangles to preview them, but it wasn't usable. I thought it is a Chrome 10 problem. But I was wrong. It is actually a really easy fix. Just go back to the about:Flags page (click the link if you are using Chrome right now). Disable the entry 'GPU Accelerated Canvas 2D'. Looks like the buggy culprit is gone. After you restart the browser, the image results will be fine again.